In today’s world of professional audio too often are we bogged down with multiple pieces of large and heavy gear. Consolidation is the name of the game! Technical Pro’s HYBRID technology is the answer to all of your needs. The HW4000U is a combined Amplifier / Pre-amplifier / Tuner built with the same quality design you would expect from Technical Pro’s superior technology. Pushing out 4000 watts of peak power and hosting a 7.2 channel up conversion this unit will exceed all expectations. The 7.2 channel up conversion will allow you to connect your iPod™ or USB sound device (normally outputting only two channels) and output to seven speakers and two powered subwoofers! Multiple source inputs allow front panel connections for a USB flash drive, SD Card, and an MP3 / iPod™ music player…in addition to a two channel and 5.1 channel RCA input on the back! The SD Card and USB flash drive inputs on the front panel of the HW4000U, allow you to connect your portable audio directly to the amplifier. So what is so special about a USB flash drive / SD Card input? Like most of us, you probably have an ever-growing library of mp3 audio files on your computer or laptop that you want to listen to while sitting on the comfort of your couch. Have you ever tripped over a wire connected to your computer or laptop and then dive onto the floor to save it from crashing and breaking into pieces? We can all agree the fewer wires in our sound system the better. A USB flash drive / SD Card lets you carry around thousands of .mp3 audio files in the palm of your hand. Simply connect the USB flash drive / SD Card to the computer and copy the.mp3 files onto the USB flash drive / SD Card. Disconnect it from the computer and connect it to the HW4000U and the unit will automatically begin playing the files from the USB flash drive / SD Card. All while keeping your laptop perfectly safe. The banana binding post outputs can connect up to four full range speakers in addition to the push button surround outputs for the surround sound speaker set up, two RCA outputs for a record line out and pre-amp output that can be used to control another amplifier. Complete with a designated preamplifier volume control and 2 mono RCA outputs for not only 1, but 2 subwoofers!! In or out, Technical Pro’s HYBRID design provides everything you need in addition to a crisp and clear sound! The face provides separate gain controls for the pre-amplifier and subwoofer outputs giving you additional control over the frequency outputs. Is your room too “boomy” or maybe is lacking that punchy bass you dream about? These separate controls will give you complete satisfaction in your sound! 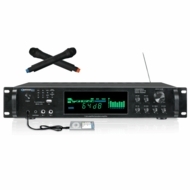 The dual mic inputs come equipped with separate control for volume, bass, treble, echo efx and a dual karaoke mic mixer. The remote control and removable rack mount brackets will provide numerous options for installation in your home theater, studio, venue or mobile DJ rig. Complete with a digital AM/FM tuner, Technical Pro’s innovative and advanced HYBRID series of amplifiers will be providing the options you need and the professional sound you expect in today’s world. In addition to have two 1/4" microphone inputs, the HW4000U comes with two wireless microphones allowing you to use the HW4000U for PA or karaoke in just seconds with no messy hookup. Technical Pro changes the face of amplifier technology with the introduction of HYBRID, a technological advance that makes bulky and inefficient amplifiers a thing of the past. We started with the same revolutionary technology found in our power amplifiers, and incorporated a pre-amp, tuner and a dual Karaoke mic mixer. With high power output, versatile loading options, high thermal capacity and reliability, the HYBRID series brings you all of what Technical Pro stands for—incredible performance and sound, versatility, and the ultimate in reliability under harsh conditions.